The global lactic acid market is estimated to witness high growth, due to rising demand from its end-use applications. It is used in the production of PLA plastics that are mainly used in packaging products that comply with environmental norms. Polylactic acid is a thermoplastic polyester. It is derived from renewable feedstock such as sugarcane, corn starch, wheat, and tapioca roots. PLA products contain bio-based renewable constituents. The global Lactic acid and polylactic acid market has been segmented on the basis of application and region. On the basis of application, the market has been segmented into biodegradable polymers, food & beverages, pharmaceuticals, personal care products, and others. The polylactic acid market has been segmented into packaging, agriculture, automobile, electronics, textiles, and others. The lactic acid market is projected to reach USD 3.82 Billion by 2020, growing at a CAGR of 18.6% during the forecast period. In 2015, the market is estimated to be dominated by North America, followed by Europe. The Asia-Pacific market is projected to grow at the highest CAGR, owing to the increasing demand for lactic acid in this region. The polylactic acid market is projected to reach USD 5.16 Billion by 2020, growing at a CAGR of 20.9% during the forecast period. In 2015, the market is estimated to be dominated by Europe, followed by North America. The Asia-Pacific market is projected to grow at the highest CAGR, owing to the increasing demand for polylactic acid in this region. The top-down and bottom-up approaches have been used to arrive at the market sizes and obtain the market forecast. Data triangulation methods have been used to perform market estimation and projection for the entire market, along with sub-segments listed in this report. Extensive secondary research was conducted to understand the market insights and trends, which was further validated through primary interviews. The report provides both qualitative and quantitative analysis of the global lactic acid and polylactic acid market, the competitive landscape, and the preferred development strategies of the key players. The key players were observed to prefer mergers & acquisitions, expansions, agreements, and new product launches as strategies to garner a larger share in this market. This report also analyzes the market dynamics. The global lactic acid market is witnessing high growth, which was mainly achieved by the growing demand from its end-use applications. The increasing demand for environment-friendly products and the high cost of products that are derived from petrochemical feed stocks are estimated to drive the demand for lactic acid. 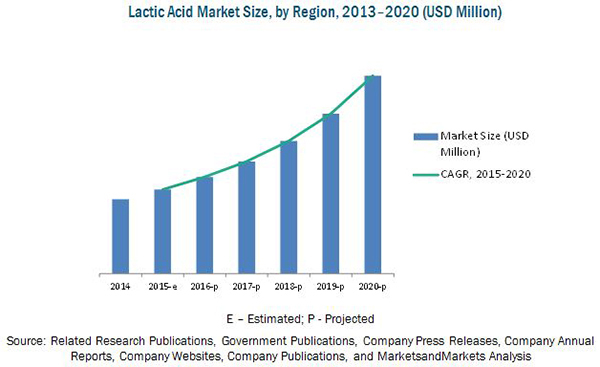 The lactic acid market is mainly driven by its end-use industries. The growth of the market in the biodegradable polymer industry is projected to primarily be driven by lactic acid-based biodegradable polymers (PLA) and lactate solvents. The polylactic acid market is witnessing a high growth, owing to increasing awareness among consumers and plastic manufacturers regarding the environment, coupled with support from government legislations and increasing landfill waste in various regions. Polylactic acid is not only a biodegradable polymer, but is also a completely bio-based polymer. The lactic and polylactic acid market has been segmented on the basis of application and region. 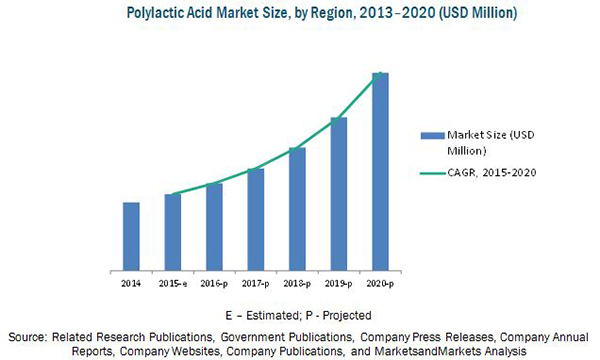 On the basis of application, the lactic acid market has been segmented into biodegradable polymers, food & beverages, pharmaceuticals, personal care products, and others. The polylactic acid market has been segmented into packaging, agriculture, automobile, electronics, textiles, and others. The report provides the complete analysis of the leading players in the lactic and polylactic acid markets, the key segments accounting for a majority of the shares, with a clear insight and commentary on the developments and trends. 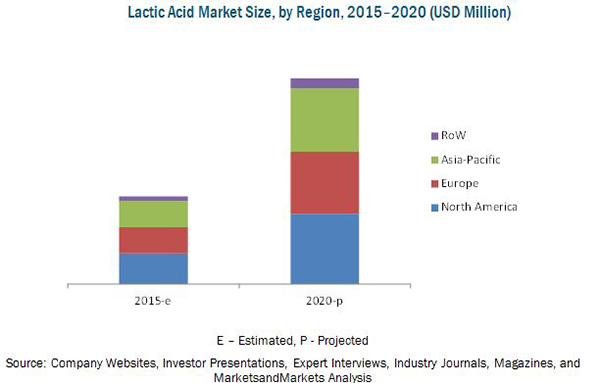 The lactic acid market is estimated to grow at a CAGR of 18.6% from 2015 to reach USD 3.82 Billion by 2020. In 2015, this market is estimated to be dominated by North America, followed by Europe. The Asia-Pacific market is projected to grow at the highest CAGR due to large use in various industrial applications such as in biodegradable polymers, food & beverages, personal care products, and pharmaceutical industries. The polylactic acid market is estimated to grow at a CAGR of 20.9% from 2015 to reach USD 5.16 Billion by 2020. In 2015, this market is estimated to be dominated by Europe, followed by North America. The Asia-Pacific market is projected to grow at the highest CAGR, owing to increasing awareness among consumers and plastic manufacturers regarding the environment, coupled with support from government legislations and increasing landfill waste in various regions. The lactic and polylactic acid market is fragmented and competitive, with a large number of players operating at regional and local levels. The key players in this market are BASF SE (Germany), CSM N.V. (The Netherlands), The Dow Chemical Company (U.S.), Teijin Ltd. (Japan), and NatureWorks LLC (U.S). These players adopted mergers & acquisitions, expansions, and agreements as their key strategies. 1.3.2 Years Considered for the Study. 12.6 Meredian Holdings Group, Inc.
12.10 WEI MON Industry Co., Ltd.
"* The companies listed are a representative sample of the market’s ecosystem and in no particular order"